In the period 2011–2015, Slovenia reported 365 different disease outbreaks. The most numerous were contact transmission outbreaks, with norovirus as the most common etiologic agent (170), followed by foodborne disease outbreaks (33). 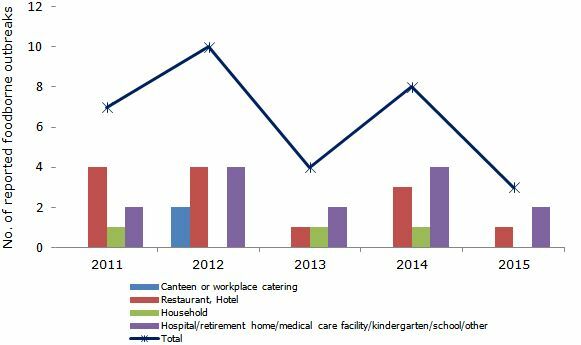 In 2015, three foodborne outbreaks were recorded with probable food vehicle. This indicator shows the number of reported foodborne disease outbreaks in Slovenia and selected EU countries. Foodborne infectious diseases are defined as diseases that are caused by microorganisms or toxins and enter the body by food ingestion. (ICD-10, A00 do A09). Food means any substance or product, whether processed, partially processed or unprocessed, intended to be, or reasonably expected to be ingested by humans. This definition includes drinking water and encompasses individual food components as well as compound food (Regulation (EC) No. 178/2002). Foodborne outbreak means the onset of two or more cases of the same disease and/or infection or a situation in which the observed number of cases of a disease or infection in humans exceeds the expected number and are linked or probably linked to common food as a source of infection (Directive 2003/99/EC). The term epidemic is sometimes used rather than ‘outbreak’ – essentially the terms have the same meaning, but the term epidemic bears a more serious connotation and is thus used less often in order to avoid negative reactions from the public. informing the general and professional public on the basis of obtained information in order to reduce the number of foodborne infections. In addition to the above-stated goals, we would like to improve the management of foodborne outbreaks, improve the quality of reporting on outbreaks and improve the cooperation and communication between regional units of the National Institute of Public Health, health and veterinary inspection services and the Ministry of Agriculture and Environment in accordance with Directive 2003/99/EC on the monitoring of zoonosis and zoonotic agents. Monitoring of foodborne outbreaks must be in the common interest of all stakeholders. Among communicable diseases, foodborne diseases are still the most common cause of morbidity and mortality and still represent a great public health challenge. By quick and timely detection of foodborne outbreaks and by well-conducted epidemiological investigation based on a harmonised and uniform methodology, we wish to provide high-quality information that will contribute to meeting the set goals. This group of communicable diseases most often includes intestinal infectious diseases caused by various agents. Animals or people excrete them with faeces and vomit, they are transmitted through unclean hands (‘dirty hand’ diseases), contaminated food (foodborne infections), water (waterborne infections) or objects (contact infections) – finding their way into the mouth of a human who gets infected, i.e. via the ‘faecal-oral transmission route’. An epidemiological basis for intestinal infectious diseases includes various animals as well as humans, with or without symptoms. Diarrhoea and vomiting are the leading clinical symptoms of the majority of intestinal infectious diseases (IID). Diarrhoea is characterised by passing loose or watery bowel movements 3 or more times in a day (or more frequently than usual). Common clinical symptoms also include increased body temperature and abdominal pain and cramping. Food intoxication is a term that describes indigestion caused by various toxins. Toxins produced by bacteria may already be present in food or are produced by bacteria in the intestines after food was ingested. Food intoxication is most often characterised by nausea and vomiting, and to a lesser degree by abdominal pain and diarrhoea. Salmonella bacteria are well known bacterial agents, while among viral agents, norovirus prevails. In the period 2011–2015, 365 various outbreaks were reported in Slovenia. The largest group is represented by contact outbreaks with norovirus as the most common identified agent (170). The second largest group includes foodborne outbreaks (33) (National Institute of Public Health, 2015). If we assume that contact outbreaks caused by norovirus probably include some related to food preparation and ingestion, we can conclude that the group of food-related outbreaks is the second largest. In 2015, 31 persons were infected during foodborne outbreaks – none of them were hospitalised (National Institute of Public Health, 2015). In one case, the agent was the Salmonella Coeln bacteria, in another Shigella Sonnei and in the third case Bacilus Cereus. Foodborne outbreaks occurred in a restaurant, in a kindergarten and on a trip to the Cape Verde Islands. In Europe, 5,251 outbreaks with 45,665 infected people were reported in 2014. Viruses were reported as the most common agents, followed by Salmonella. The most common sources of infections were eggs, mixed food and fish or fish products. From the available data, we can conclude that in 2014, the highest number of outbreaks was reported in France (1,364), followed by Latvia (491) and Slovakia (465) (ECDC, 2015). Author(s): Tatjana Frelih, dr. med. spec. of epidemiology, Mateja Blaško Markič, dipl.san.ing., Ana Hojs, dr. med. spec. of hygiene, Eva Grilc, dr. med. spec. of epidemiology, National Institute of Public Health.